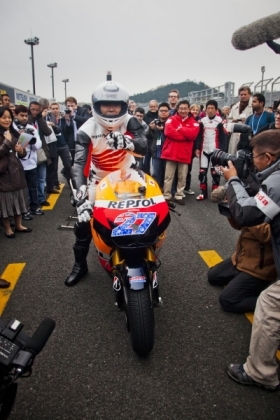 Honda CEO Takanobu Ito blasted around a racetrack last week on a Honda MotoGP racing motorcycle in Japan. Being the CEO of a Japanese automaker seems to have gotten a lot riskier, especially in the run up to the Tokyo auto show. On Nov. 27, Toyota boss Akio Toyoda wowed a crowd of spectators in Japan by racing through a lineup of Lexus LFA supercars in the new Toyota 86 sporty coupe. One day later, Honda CEO Takanobu Ito hopped on a Honda MotoGP racing motorcycle and blasted around the company's Twin Ring Motegi racetrack. No word yet on whether Nissan CEO Carlos Ghosn plans to jump 10 buses in a Leaf, but don't rule it out before the show wraps up Dec. 11.